The Black Dungeon Doorway is Part 1 of a trilogy. Part 2 is Planes Of Existence. Part 3 is Door Of Light. 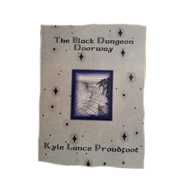 The Black Dungeon Doorway is a science fiction/fantasy novel with 4 Character Classes: Orthe, Wodora, Aera and Pyre. It is a romping metaphysical exploration through worlds and different realities. Therefore, in other words, dream worlds. It is also a philisophical and psychological exploration through the human mind, using a symbological 3D map which is also a puzzle to figure out. The Black Dungeon Doorway is published by AuthorHouse UK and is FOR SALE at Internet Booksellers such as Amazon.